MIAMI — When Gino Castellanos, 22, made his way to Florida from Cuba six years ago, his plan was to eventually marry his high school sweetheart, Helen Obediente, and bring her to the U.S. to live with him. They got engaged and applied for a fiancée visa in 2015. But frustrated by the lengthy process, they decided to tie the knot. In May 2016, Castellanos traveled to Havana, the young couple wed, and Obediente filed for an immigrant visa, as the spouse of an American citizen. Enthusiasm built around the couple's reunification. Castellanos had a studio prepared for them and his mother had a job lined up for Obediente at her cigar shop. But a process that would normally take between 12 to 15 months has turned into an ordeal for the couple. As tensions between the U.S. and Cuba have risen recently, caught in the middle are Cubans and Cuban-Americans on both sides of the Florida straits, whose lives have once again been disrupted over politics. Three years after the two countries awed the world announcing they would reestablish diplomatic ties, leaving behind more than half a century of hostility, it appears the fragile détente is slowly dissipating. Under former president Barack Obama, the two countries opened embassies, expanded travel options, restored commercial flights and negotiated agreements on the environment, law enforcement, the postal service, and communications. Obama was the first U.S. president in over five decades to visit Cuba, and ordinary Cubans welcomed his speech as hopeful of a more conciliatory time between the two Cold War enemies. But things have changed. The Trump administration has taken a harder line toward Cuba and reversed some of Obama's historic policy changes. Add to that the evacuation of U.S. embassy personnel as a response to suspected attacks that have baffled intelligence experts. This has left many Cubans worried about the future of relations between the two countries and its impact on their daily lives. For Castellanos and Obediente, a series of events caused a disappointing setback in their reunification. Obediente's interview at the U.S. Embassy in Cuba, the last step in the visa process, was scheduled for September 13. But as luck would have it, Hurricane Irma rammed into the island days before the interview and it was moved to November. The interview never happened. On September 29, news broke that non-essential U.S. Embassy personnel were being withdrawn and virtually all visa processing in Havana would be halted. Castellano's heart sank. The evacuation was due to what the U.S. described as a series of health attacks against American officials and their relatives, between the Fall of 2016 and August 2017. A total of 24 people had fallen ill with symptoms including hearing, vision, balance, and memory damage. The Associated Press reported recently that doctors treating the embassy personnel have found abnormalities in their brains. Although the U.S. has never accused the Cuban government of perpetrating the attacks, officials have said Cuba has not met its obligation to protect diplomats on its territory. Secretary of State Rex Tillerson suggested recently that Cuba could have stopped the "targeted attacks." He said they have a small island and a sophisticated security apparatus. "You probably know who is doing it. You can stop it. It's as simple as that," said Tillerson. Cuba's communist-led government maintains tight control over many aspects of life on the island. Their government has vehemently denied being involved and has claimed the U.S. has been "deliberately lying" about the attacks. 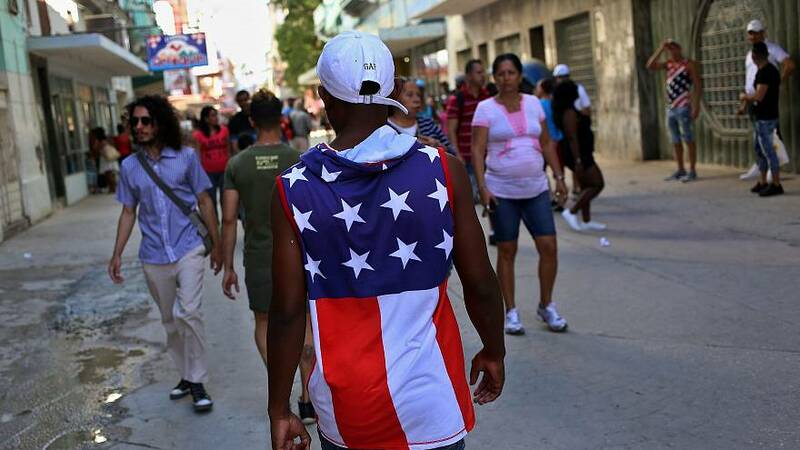 But caught in the middle of the bizarre attacks and tough talk between the two countries are countless Cubans, like Castellanos, who is growing impatient with his wife's situation. "It's frustrating and I miss her," he said. It's hard to plan for the future because he does not know when his wife will join him. Cubans seeking immigrant visas must now travel to the U.S. Embassy in Bogotá, Colombia for their interviews. "A lot of Cubans simply cannot afford that," said Miami immigration attorney Angel Leal, who is handling Castellano's case. Castellanos and his wife have yet to be notified of the new interview date in Bogotá. Further complicating matters, Cuban nationals must first seek a visa from Colombia before traveling there for the interview. Leal said "this has everyone in limbo right now. It's a lot of hardship and a lot of people who are suffering." Amid the attacks, the U.S. expelled 15 Cuban diplomats from Washington, saying it was intended to force Cuba to place its embassy on the same emergency status that the U.S. is operating under in Havana. Cuban officials have told their U.S. counterparts during recent talks earlier this week that suspending visa processing was "seriously hampering" family relations. Because of the attacks, the U.S. State Department also issued a travel warning, advising Americans against travel to the island, stating "U.S. citizens may also be at risk." The statement confounded tourists with plans to visit the island. Between Hurricane Irma and the embassy attacks, small business owners, known as cuentapropistas in Cuba, began feeling the effects of a decrease in tourism. But some of them were unprepared for the financial hit their businesses would take after Trump followed through on his campaign promise to roll back on some of Obama's policies of engagement. In early November, the administration reversedObama administration changes and announced that Americans would, once again, have to travel as part of organized tour groups run by U.S. companies. The regulations also include a ban on Americans doing business with the large military-run corporations that control the Cuban economy. "We have strengthened our Cuba policies to channel economic activity away from the Cuban military and to encourage the government to move toward greater political and economic freedom for the Cuban people," said Treasury Secretary Steven Mnuchin. These include Gaviota, the largest tourism company, CAESA, which controls most of the retail business, and Habaguanex, which runs Old Havana. Sen. Marco Rubio, R-Fla., advised Trump on Cuba policy and is among the Cuban Americans who favor a hard line toward the Cuban government, including a full embargo on Cuba until democracy and human rights are restored on the island. In fact, Rubio criticized Trump's policy changes as not going far enough, saying it omitted companies like Gran Caribe Hotel Group and Cubanacan that also have ties to the Cuban government. The aim of Trump's policy, officials say, is to prevent Cuba's government from benefiting from American tourism. The ban includes 180 Cuban government entities, including 83 state-owned hotels. But critics say these changes are actually counterproductive for the small business owners in the island who were seeing gains from closer U.S.-Cuba relations. Baruch College professor Ted Henken, the co-author of "Entrepreneurial Cuba: The Changing Policy Landscape, says that while Trump's policies may be shifting some American commerce away from the Cuban state, "it's not worth the overall impact of a significant shrinkage of the (economic) pie itself." Cubans in the private sector, especially those with small businesses, say they are struggling to remain open with the decline in American tourists, which had soared by 118 percent during the first three months of 2017, compared to the same period last year. That early surge, before Trump's policy changes, has dwindled, say Cubans in the island. Celia Mendoza, 28, owns a bed and breakfast and is the manager of "Concierge Habana," a small private booking firm for other bed and breakfasts, restaurants, and classic American cars. For the past four months she has seen a decline in Americans using the services. She worries about the business she built, explaining it was difficult to acquire a license from the state to open it. She developed a webpage - a painstaking task because of the scarce and slow internet connection on the island. But with the money she has earned, she purchased a home and traveled to the U.S.
Now she is concerned about having to let go of her staff. "Basically, they're saying they want to help us. But they're not helping us. They're killing us," Mendoza told NBC News. A tougher stance against Cuba is not shared by the majority of Americans, who support normalizing relations with Cuba and ending the decades-old trade embargo, according to polls. Julia de la Rosa, 49, a former employee of the ministry of culture, opened a bed and breakfast with her husband in 1996, when the island was in the midst of an economic crisis. They initially struggled to gather enough capital, but were able to rent two rooms in their home. With time, they expanded to ten. Now she is stressed about potentially laying off some of her fifteen workers if the decline in American tourists continues. In November, she and a group of other Cuban businesswomen invited Rubio to the island to explain the impact the new policy has had on their businesses. She also penned an op-ed in the Miami Herald explaining how the new policy is hurting entrepreneurs. She remains uneasy about the future. "I feel disappointed. I feel hopeless. I don't see a bright future," she said. NBC News producer Orlando Matos reported from Havana.